2.1. 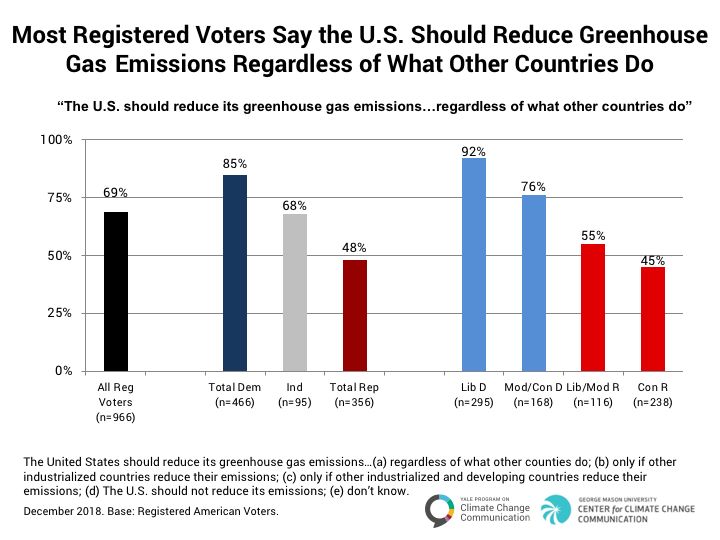 Most registered voters say the United States should reduce greenhouse gas emissions, regardless of what other countries do. Most registered voters think the United States should reduce its greenhouse gas emissions, regardless of what other countries do (69%). Majorities of liberal Democrats (92%), moderate/conservative Democrats (76%), and liberal/moderate Republicans (55%) take this position, as do 45% of conservative Republicans. Only 5% of registered voters (including 2% of Democrats and 3% of Independents, but 11% of Republicans) say the United States should not reduce its emissions (see Data Tables). Read the Next Section Online 3. Who is Responsible for Action on Global Warming?